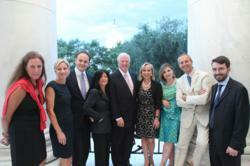 A delegation of leading Italian winemakers (Allegrini Wineries, Casetllo Banfi, Cantine Ferrari, GIV, Terredora Winery, Casa Vinicola Zonin) convened with representatives of the House of Congress in Washington on July 19th for a historic event on Capitol Hill. Cristina Mariani-May, Co-owner of Castello Banfi from Tuscany remarks: "We had an incredible day. Vinitaly is indeed a true Ambassador for Italian wines. Its ability to bring together the most important Italian and US officials is so impressive. It was a true honor. " Wine Caucus chairmen Rep. Mike Thompson (D-St. Helena) and Rep. Dan Lungren (R-CA 3rd District) opened the gathering by stressing the good relationship between the USA and Italy as Congressman Thompson referred to Italy as “one of our greatest allies." Italian Ambassador Bisogniero anticipated that wine will be an integral part of the 2013 program, the year of Italian culture in the United States. The bond between wine aficionados superseded politics, as wine had become an integral part of both cultures. The attending parties are looking forward to build a strong, fair and balanced relationship between their respective wine industries in the future. Before the event on Capitol Hill, representatives of the Alcohol and Tobacco Tax and Trade Bureau’s (TTB) presented the latest developments of the federal agency to the Italian wine makers at a special meeting at the Italian Embassy. The newest bureau under the Department of the Treasury TTB, highlighted the fact that wine labelling rules had been simplified, allowing for changes without requesting a new Certificate of Label Approval (COLA). The US represents one of the most important markets for Italian Wines as 28% of all wine imported to the USA in 2011 came from Italy, which represents a 15,1% increase to 2010. 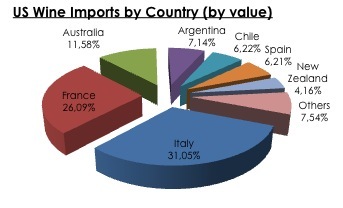 In the last three years Italy has increased its leadership in the US against its major competitors, both in terms of value with 31% (Graph 1) reaching $1.5 billion in 2011 and volume as 31 million cases (2,85 Mhl) of Italian wine were imported into the USA in 2011. The OIV wine statistics from 2011 (Graph 2) also show that the world wine consumption (244.3 Mhl) has slightly increased to previous years. France still leads as the biggest internal wine market with 29.9 Mhl of wine consumed, followed by the USA (28.5 Mhl), while Italy decreased their wine consumption (23 Mhl), further emphasising the importance of the USA as an export market for Italian wine. Veronafiere is the leading organizer of trade shows in Italy including Vinitaly, the largest wine event in the world. In 2012, over 4200 exhibitors showcased their wines to 140,000+ visitors (35% from outside of Italy representing over 120 countries). Veronafiere showcases Vinitaly in the World http://www.vinitalytour.com to develop an international platform for the promotion of Italian wine and food sectors. Next stop of Vinitaly Tour USA will be on January 22nd 2013 in New York City and January 24th in Miami, Florida. The bipartisan Congressional Wine Caucus, established in 1999 by Congressman Mike Thompson (D-St. Helena) and former Congressman George Radanovich (R-Mariposa)), brings together about 200 Members of Congress representing all 50 states. Members of the Congressional Wine Caucus are joined not just by their deep appreciation of wine, but also by their understanding of the industry’s significant economic impact. The wine industry contributes an estimated $162 billion to the U.S. economy annually and provides the equivalent of 1.1 million full-time jobs.